There is an episode of South Park, where a schoolboy named Butters spends his pastime trying to come up with a series of schemes to take over the world. Unfortunately, every time he is on the brink of implementing some scheme or another, his friends come along and remind him that Simpsons already did that before. The reason I remembered South Park is that actively thinking about reinventing search at times feels like Butters attempts to take over the world. But this time, it is Google, not the Simpsons, who has beat you to pretty much any new idea you can think of. And yet, even within this competitive space, there is always something new that can be discovered if one becomes familiar enough with the everyday routines of your product's users. In the case of Contentful, talking to our most active users made us aware of how difficult it is to locate the right piece of content using basic search tools and regular keywords under certain scenarios. So today we released a vastly improved search to make it much easier for you and your editors to find the information you're looking for! Before we jump to actual features, let’s take a step back to understand the problem a bit better. We have at least several dozen media publishers using the Contentful platform to serve blog posts and news stories for daily consumption. While online publishing might seem like a straightforward business, every news story goes through a lengthy publishing process before it hits a smartphone screen. A journalist writes the original article, which is then vetted by a fact checker, the visual editor adds a relevant picture and perhaps a caption, while an intern might help out with prepping mobile thumbnails and checking hyperlinks. Finally a senior editor adds a headline, signs off on the story and puts it into the publishing queue. News organizations put out several dozens of stories daily, so the process is repeated multiple times a day, in a high-pressure environment where the editorial team is racing against time to get the story out. Little wonder then that members of the editorial team approach search with inquiries that have nothing to do with keywords. For example, while an editor might be looking for all the unpublished stories waiting to be reviewed, an art director is more likely to search for images freshly uploaded by interns, while a journalist will occasionally want to see all stories he wrote. So how do you accommodate all these disparate scenarios without drowning users in a sea of dropdowns and checkboxes? Our first priority was to ensure that search context is as unambiguous as possible. Say, you maintain a movie review website and search for "Bridges", what kind of results would you expect to see? As long as the content selector is set to “All”, you will see all entries matching your query come up in your search results. So, actor Jeff Bridges will show up with the movie "The Bridges of Madison County" and the production company Hollywood Media Bridge. Selecting specific content type, on the other hand, would restrict search results to entries of that type, e.g. you would see either "Jeff Bridges" or "The Bridges of Madison County" or "Hollywood Media Bridge". Next, we felt it is important to allow users to move away from keyword-driven search to a more abstract querying. This is why we rebuilt Contentful's search to handle queries around meta-data, which is all the invisible data associated with your entries. 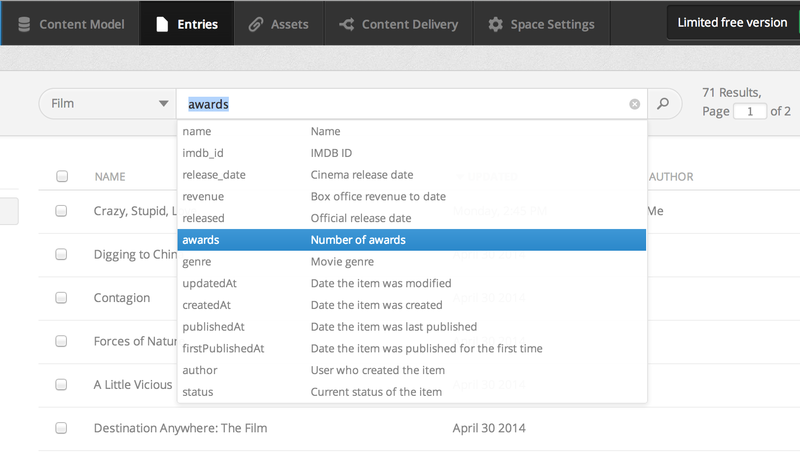 This addition allows you to filter your entries to only include items created on a certain date, authored by a specific member of the team, or still waiting to be published. The full list of meta variables is visible upon hitting the down arrow key in the search field. Recognizing the fact that logical operators used with variables like dates and file sizes are not a part of everyday language, we automatically provide a list of clearly labeled operators every time you select matching variables. The really neat thing about the new search however is that it effortlessly adapts to your content. Whenever you are searching among entries of a specific type, Contentful allows you to use specific fields from your content types in addition to pre-defined search variables. To come back to the earlier example of managing a movie review website, limiting the search to entries in the “Actors” category would allow you to query only the bio field or narrow down actors by filtering by roles. Meanwhile, switching to the list of “Movies” would enable you to filter entries by genre and box office revenues. We also take the guessing out of the search by providing auto-complete options for all the fields that have predefined values. So selecting gender would immediately offer a choice between male and female, while choosing "Oscar winner?" is likely to come with Yes/No options. The simple changes we introduced above can be combined in all sorts of ways permitting you to go as broad or be as specific as you want. Just learn to combine keywords, meta variables and search context and you will get down to the item you are looking for in no time.